Things were pretty hectic for me today…. Scurrying about…… getting ready for company (not complaining!! )….making sure that things are in order…..
Then I started feeling overwhelmed….how am I going to do it all…. 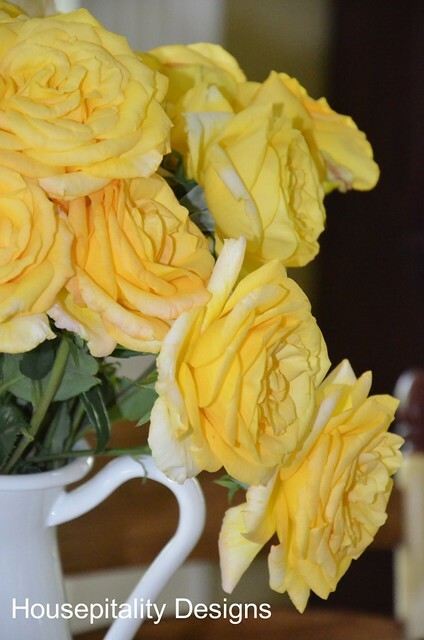 My hubby goes out to get the mail…comes back inside with this huge jar of roses…..
……at least three dozen yellow roses….ahh, I see you have an admirer, he says…. 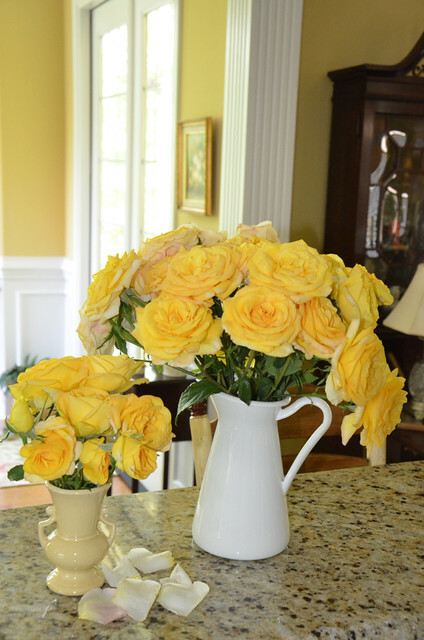 They were from my friend Barb…I featured her Rose Garden the other day…. ……telling me to stop and smell the roses darn it!!…. As my mom always says…For life is good….really good…because I woke up today and saw the sun!! Now I am off to make some hot dog pie…made famous by the culinary genius, KariAnne.…I think my company will love it! Wow, talk about timing!!!! And do take Linda’s advice as life is to short not to smell the roses. Those are beautiful and I really love the yellow ones. Now go make that pie. Your company is going to enjoy this evening for sure. Great folks, great food, and wonderful roses. Life is good! Enjoy your family and friends..
Those roses are stunning, Shirley! Another flower I’m missing from my old house. I had several rose bushes in our back yard. No yellows, but these are gorgeous. Beautiful!!! What a good friend and neighbor!!! There really is nothing like the scent of beautiful flowers to cheer your day. As for this hot dog pie situation, you know you have piqued everyone’s curiosity…mine included!!! Just beautiful Shirley!~ Enjoy your weekend…thank you so much too for helping me find a home tour! I will be sure to mention that when I do yours in a few weeks. I’m glad you were able to take time to smell the roses thanks to a very thoughtful neighbor, Barb. I miss you and I’m glad she read my mind. Enjoy! The rose fairy is indeed a generous woman!! How sweet that she shared her roses with you! 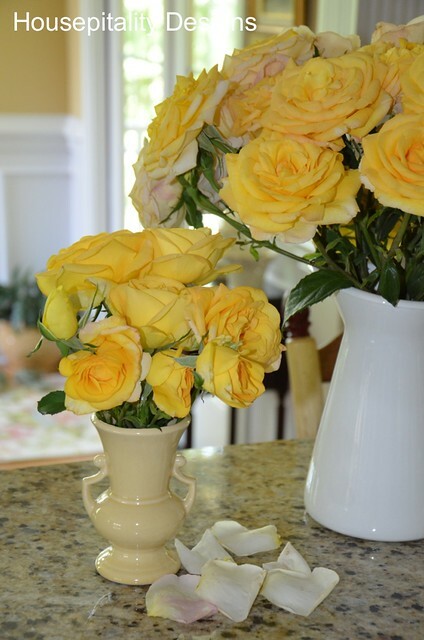 She probably knew the yellow ones would be beautiful in your house with the yellow walls! I know that hectic feeling well. 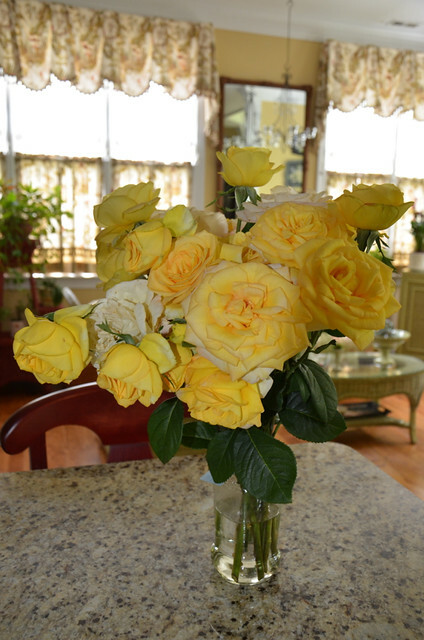 But how nice to have a neighbor like Barb- and those roses! Oh my. I just read your post on her garden. 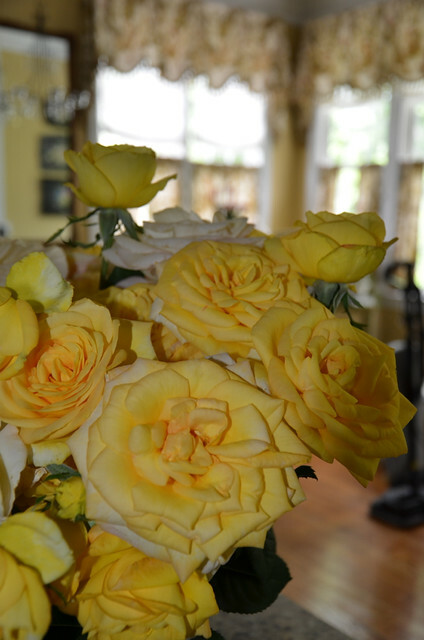 Beautiful roses and I love the curtains in the background. Your roses are beautiful and you are amazing my wonderful friend. Your roses are beautiful my wonderful friend. Hi Shirley, let’s see if unchecking the box makes the roses smell sweeter.